(From left, back) Emily Thompson, Natalie Thompson, Megan Gautier, (front); Anna Claire Seago, and Mary Grace Downs. 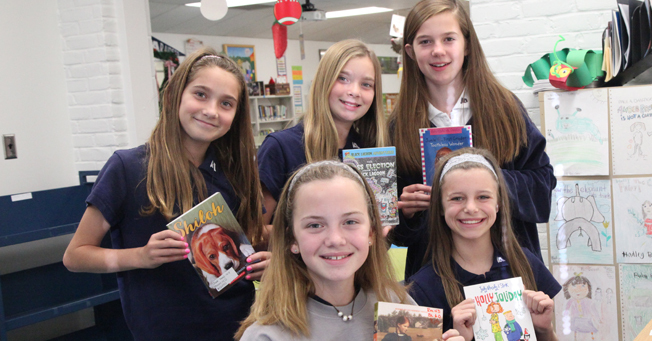 A group of JA sixth graders have coordinated a book drive to benefit students at Brown Elementary. Brown Elementary in Jackson offers Accelerated Reading, but needs books to make the program work well. Megan Gautier, Natalie Thompson, Emily Thompson, Anna Claire Seago, and Mary Grace Downs, with support from Librarian Suzie Adcock, organized the collection of books. Before sending books to Brown Elementary, the girls arrive to school early or stay after school to create AR labels with the book level, AR number, and other information. They also make bookmarks for the students at Brown Elementary. JA students in grades one through six participated in the book drive that is sending 3,000 books to the elementary school. For twins Emily and Natalie Thompson, working with books, volunteering, and promoting reading are a part of their family legacy. Their mother is active in community and volunteer work. Their grandmother was a librarian who loved reading. Their great, great aunt was Eudora Welty. “I hear each day about Brown elementary,” said Emily and Natalie’s mom, Crystal Thompson, in a letter written to Suzie Adcock. “They ask to stay and help you and also ask to come in early to help. It makes my heart melt when they ask each night to come early to help. Not only are they surrounded by books, but they also are seeing the benefit of doing for others.” Their mom also hopes that the project will help the girls grow up loving books and loving to read, as did the women in their family who modeled a love for the written word.